The headlines almost uniformly report the Trump Presidency was a failure. Trump was a complete and total disaster and everything he touched turned to liberal progressive pain and disgust. The media all over has it figured and the problem is that Trump cannot do anything right. Or maybe it is he does everything right when to succeed everybody knows you have to be on the left, not just right. You see left is good, left is correct and right is just plain wrong. And whatever you do, do not come forward and say that Trump has not even been sworn in yet because that doesn’t matter, he’s a failure and nothing you or he can do will change that. What if the economy takes off and both the markets, numbers of people employed and all other indicators fly high after he takes office? Well, obviously you must have missed the eight years of dedications and making the hard choices by President Obama which are finally paying off. Trump is simply reaping the rewards of all of President Obama’s brilliant handling of the economy. Had President Obama been permitted a third term or Hillary Clinton been elected, then they would have gained and gleaned all the glory but instead it is falling undeservedly on Donald Trump. No, there is little hope that the average American will understand these things as they are just so complex. This is how it always happens that a Democrat’s hard work is then claimed by their Republican successor when the difficult work was done before the Republican came into office. Reagan gained acclaim for all the work done by Jimmy Carter. It was President Carter’s examples of selflessness and showing that even a Capitalist can have a heart which wore down the USSR and not that military wastefulness of Reagan who claimed to have spent the Soviets into ruin. Have you ever heard anything so preposterous? They were brought low by love and caring of President Carter and not the brashness and impolite efforts of that brutish Reagan and everybody who knows anything knows that. Reagan also took credit for the economy made possible by President Carter’s fiscal policies. Like President Obama, President Carter inherited an economy teetering on the edge of oblivion and saved the United States from guaranteed ruination but does he ever get the credit for that miracle, no. Instead the historians have been pulled in by Reagan’s allure and simple charm. Simple charm, it was more like simpleton charlatan than simple charm. What they will not claim despite all the honest evidence. Everybody who understands reality knows the truth and knows that the truth is often sacrificed because it is simpler to cheer and root for the new kid than recognize the dedication and hard work done by the predecessor who actually set the stage for the triumphant simpleton who lucked into the glories made possible by leftist policies carried out by the hard work of the previous administration. One great example has been Carrier deciding to keep a fair number of jobs and production in the United States rather than move it to Mexico. We understand that you heard it was because of efforts by Trump and Pence which arranged for these jobs to be kept in the United States rather than transferred to Mexico. Well, they have tried to steal the glory but remember who is in the White House and finally should be receiving the credits he is due. President Obama saved those jobs with his well-crafted policies designed to retain jobs in the United States finally paying dividends, but as is the Republican way, they stole the glory and thunder of a Democrat administration’s accomplishments. Their blatant disregard for facts is just appalling. What will they claim next, that they are able to rebuild the military? The sole reason they are able to rebuild anything concerning the military has been due to the marshalling of efforts and the cutting of numerous wasteful military projects in favor of a more integrated military with a shared ability with their European counterparts. The Obama Administration had streamlined the military and its prolific spending and made it into a lean, green fighting machine and now Trump thinks he can simple ride in on his white steed and claim all the glory. Well, not if the media has anything to say about this glory hound who is never there for the hard work but first in line when taking credit is due. It has already been made clear that Donald Trump has no shame and will bathe himself in the glories only made possible by the hard and dedicated work of his predecessor who will receive no credit for his efforts. Donald Trump, just like Ronald Reagan, will be front and center to claim the great leaps and gains of the American economy which is simply responding to the inevitable wondrous gains in leaps and bounds due to what President Obama managed to accomplish despite a do nothing Congress and all the chips down against his success. While nothing could prevent the great recovery put in place by the policies of President Obama, heaven knows that Trump tried to ruin everything with his fiscal policies. It was simply more in place thanks to President Obama and his dedication setting the stage for a recovery which unfortunately for President Obama will come too little too late. Still, the historians will likely get everything sorted out and President Obama will rise meteorically and rival any President before and likely after him in what he accomplished. How else can the media report the greatness and the legacy which rightfully belongs to President Obama but will be stolen by his Republican successor. It is such an old trend where President Eisenhower inherited the result of Franklin Delano Roosevelt and continued by Harry Truman. We saw it with Ronald Reagan, a man who knew how to milk a scene from his days in Hollywood. Now we sit prepared to hear how Donald Trump will be appointing a man responsible for this betrayal as the bird awaits orders for the glamour shots to be taken. It was made all the more obvious as the President Elect stole the wonder which rightfully belonged to the team of the Obama Presidency. Be prepared for stories such as these as Trump’s policy reversals and smart management start to take hold. The one thing the media will have gotten correct is that President Obama may never get the credit he deserves for rescuing America from ruin. The preceding was an exercise in sarcasm though this may be exactly what we are bound to hear for the next decade and possibly longer. We on the conservative end of the political spectrum can expect to read article after article in the likes of the New York Times just like what is written above except they will be serious as a heart attack. Their famous Pulitzer Prize winning writers will return and do their best to eviscerate Trump, his Cabinet choices and anything they have a hand in creating. Finally, the newsprint accusations will flirt with the truth just enough to make their condemnations sound credible. What Americans can do is ignore the media and take their news from their own lives and those of their friends, neighbors and yes, even liberals. Just nod knowingly as they explain how everything Trump accomplishes was actually due to President Obama who did all the heavy lifting. We know that there will be need for people capable of herculean abilities if the United States is to be rescued and placed back on the rails. All the way along the Progressives will be digging up the tracks and dynamiting the bridges in attempts to force Trump failures but even after such subterfuge The Donald will prevail. What will happen is that as long as Trump is in office, and presumably Pence after Trump leaves office, there will be sniping and biting at the ankles in attempts to destabilize the economy as well as governance in order to blame Trump. The secret to preventing such is to elect like-minded people to serve with the next Congress making Trump’s task that much easier. But do know the mainstream media will stop at nothing to undercut your efforts and those of Donald Trump. Do not fret as The Donald is a big boy and has taken down his share of bullies and these paper tigers of the media have absolutely no clue what is coming their way. Pop some popcorn and sit back after January 20, 2017 and prepare for the greatest show on Earth, and should we send the right thinking candidates to Congress for the next six years, three elections, then it just may be possible to wrest the United States from the death-grip of the looney left and put America on the tracks of being great again. 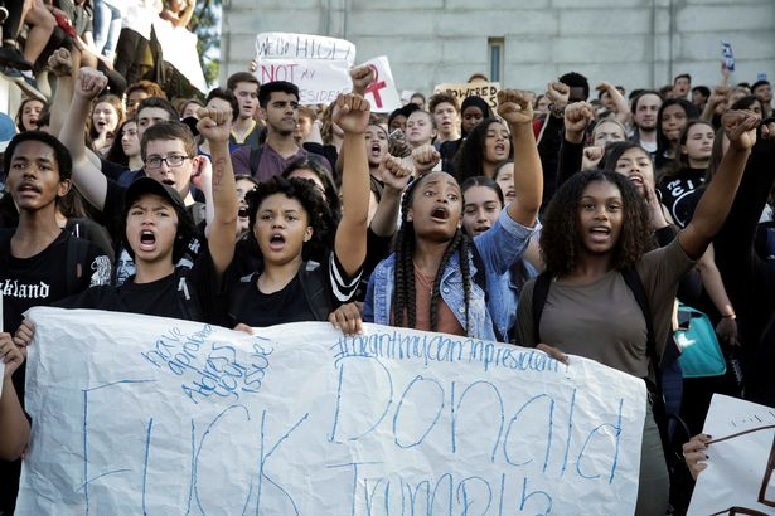 The demonstrations (riots) occurring across the United States largely in the major cities, especially Democrat Party strongholds claiming that Trump is not, can not and never will be their President refuse to abate. Apart from this being a definite example of delusional denial, it is also much ado about nothing as the rules on how the office of President is chosen has been known for well over two-hundred years and all contenders understood the rules going in. It is not like Hillary Clinton has even shown the slightest designs or desires to challenge the results. There has been a number of disgusting results turn from these examples of bad behavior with one of the most egregious was the beating of a fifteen year old Rockville, Maryland High School student by numerous classmates for wearing a “Make America Great Again” hat. This was far from the only casualty from the protests where stores have been breached with their windows smashed and merchandise stolen. In one case a Starbucks Coffee store was broken into and coffee mugs were stolen and used as projectiles thrown at the police. Numerous other reports have surfaced of Trump supporters or just some refusing to join the protests being pummeled and beaten simply for not agreeing with the mob. For those who agree with these activities I have a simple question, what would your reaction have been if Hillary Clinton had won the Electoral College vote but lost narrowly in the popular vote and Trump supporters took to the streets rioting and beating Hillary supporters? If that would have struck you as indefensible, as I would hope it would, why are the current malcontents then tolerated. If Hillary supporters and all who voted for any of the candidates other than Trump, especially respected members of those groups, would come out and denounce these rioters then perhaps the United States could start working towards healing. Civility is the basis for civilization and what allows disparate groups to coexist despite differing opinions. Elections are presumably the peaceful means for choosing leaders which has presumably been accepted as a replacement for generals or others leading their band of armed insurrectionists and taking the seat of power by force. That is the alternative which these demonstrators, especially those causing damage and beating anyone thought to be from the opposition, and the reason elections were initiated. Changing government by revolution every time a sizeable and well-armed group decided they should lead coming in and murdering the current leaders and destroying much of the capital city and sometimes leading to a major civil war destroying much of the kingdom all just to make a transition in power might be considered paying too high a price when compared to simply voting. Is this the system which is now being proposed by those rioting in the streets? Do any of them really believe they are going to get their way and Hillary Clinton will suddenly become the next President because they are rioting and destroying property? Lastly, what gives with the governors and mayors who are permitting such lawlessness? And lastly, enough with the ridiculous Trump supports the KKK or the Nazis or white supremacists of any stripe. That is no more true than Hillary Clinton being called a Communist or an Anarchist simply because some well-know Communist sympathizers or Anarchists came out supporting her, as I am sure there were at least a few. Just because some malcontent from any extreme on the political spectrum comes out in support does not make the candidate a supporter of the extremists represented by the particular claim of support. We do not control which crazies support a candidate and often cannot fathom even why there might be any reason for such support. Donald Trump has little to no actions in his past which infer in the slightest that he has a bigoted bone in his body. He is not a racist, anti-Semite, homophobe, sexist or even misogynist, though some might try to argue the last due to his action in decades past when male-female relations were quite different than today. Then there is the claim that the Electoral College is unfair as it grants a resident of Wyoming as carrying greater weight than a resident of California or Texas or New York or even Alaska. Oddly enough, that was the whole idea of the Electoral College. When the Constitution was drawn up the founding Fathers realized quite quickly that any candidate for President if they could win New York and Virginia by wide margins could lose nine of the remaining eleven states and still win the election. This, in their thoughtful minds, seemed to give Virginia and New York far too much power and they needed all the states to sign onto the new Constitution. Remember the Federated States of America was the dysfunctional governance where the Federal government was too weak to run the nation and the country was disintegrating. The Constitution was the grand compromise which gave the smaller states significant additional representation in choosing a President simply by adding two Electoral Votes, one for each Senator, to the number of Representatives and thus making it so all the states would be represented in the White House. As the United States grew and Wyoming became the least settled state per square mile, Wyoming receives the greatest benefit of the Electoral College system and California is likely harmed the most followed by Texas, but it all works in the end as Wyoming still has but three Electoral Votes and is seldom the deciding state. We need remember that without the Electoral College system the United States would never have come into being and the Federated States of America would have dissolved into individual states and more resembled Europe economically, militarily and in all too many other ways, Alaska would still be a part of Russia, Hawaii would still be a Spanish colony or an independent nation, Texas would either be its own nation or still part of Mexico after Santa Anna beat the Texas militias. And Wyoming would still be Wyoming all alone and pretty much ignored as nobody would want to take the time or energy to conquer her. Wyoming would be pretty much unchanged as any invading army would need to defeat a number of states before reaching Wyoming and then would stand little chance against the mountain men who know their woodlands and highlands very well and live as they please even now. Lastly, Wyoming has some of the most breathtaking views that can be found anywhere within the United States, and that comes from having lived there. In closing, can we do something which has gotten the United States through tougher and more distressing times than anything a President Trump can cause. The country is nowhere near as divided as many seem to wish to have it appear. You might have heard of this other time when brother took up arms against brother and the nation was divided into the blue and the grey and we fought a Civil War, a real Civil War and not just civil unrest. We realize you believe you are fighting a civil war, but trust that you are not and should you actually become that violent, well, let us just warn that you would not like how that would end. The United States survived President Grant, it survived President James K. Polk who did not even campaign but was elected due to two things, the party he represented had the election in the bag and his opponent ran on the slogan of, “Who the h3ll is James K. Polk?” Perhaps if his opponent, who is just as nameless today as then, had campaigned with his name in a slogan instead of his opposition, perhaps he might have won but instead all anyone knew was both sides were preoccupied with James K. Polk. He ran against Henry Clay who was one of the founding members of the Whig Party. We even survived a President who pretended to have a middle name, well, middle initial because all the great Presidents had a middle name. Thus we had President Harry S (for nothing) Truman sometimes stated by his contemporaries as Harry ask for nothing Truman because persuading Harry Truman was wasted effort as he drew his own course and never deviated from a decision and was the reason for a sign on his desk which faced the door reading, “The Buck Stops Here.” We survived a President who was an avid big game hunter, went hunting with the Czar of Russia and spent as little time in Washington as possible, a man who despite great wealth gathered a group of roughnecks and went to war because it would be jolly fun, yep, President Theodore Roosevelt. The United States has survived virtually every kind of President imaginable, Harvard educated, Yale educated and self-taught, raised in luxury and poverty, military men and pacifists and somehow the United States has developed a life of its own which manages to always return to a central pillar based on equal freedoms being granted to ever wider portions of the nation’s peoples. One example was due to President elect Donald Trump who opened his Palm Beach resort called Mar-a-Lago; he insisted that it be opened to everybody including specifically Jews and Blacks, something never permitted in “exclusive” resorts, clubs and other venues breaking this barrier which held into the 1990s. The outrageous fact here is not that it was Donald Trump who broke the barrier and fought a running battle with the city officials for over a decade because of his inclusive policies but that Palm Beach had such rules in place into the 1990s and was still regarded as an all American resort town, now that is unbelievable and a truth that needs more emphasis. Still, if we all calm down we will survive the coming four years and then we can review whether Donald Trump was more President or clown and if clown, replace him and get on with life. Thank you. We realize that the fact that the majority of us who supported Donald Trump and came out in his favor despite his shortcomings and other difficulties was because you drove us outside of our safe-zones, which are far larger than yours as we are nowhere near as easily perturbed by the rest of humanity as you appear to be. You lost a singular election. We were polite during the past twenty-eight years since we rose from our endlessly toiling and had our desired person in the White House. We are the next generation of quiet Americans who elected Ronald Reagan. They call us the silent majority because when we lose the election we simply return to work Wednesday morning and do our jobs. We definitely do not riot, smash other people’s windows, destroy their vehicles, steal merchandise or any of the other lawlessness which far too many of the tender aged youth along with associated paid agitators, trainers and riot leaders who are leading you onward in your own eventual destruction. Stop and ask yourself exactly why you are really out in the streets being part of an ignorant mob being used by those who would enslave each and every one of you. If you can answer why somebody as tainted and corrupt as Hillary Clinton, whose track record looks more like an accident spread across the many years and her campaign was the celebration of rules for the masses, that includes all of you and the rest of us, but no rules for your superiors, the few holding the power then maybe somebody will listen and even care and you will have an accomplishment. At the very least, Trump does not owe foreign and dangerous influences favors for their generous gifts to his own slush fund disguised as a charitable institution. Yes, that’s right; we are referring to the Clinton Foundation. Has Trump cut some corners and likely pulled his share of rolling stops at blinking red traffic signals. Who hasn’t? Still, President elect Donald Trump will not be tied to any moneyed interests except for businesses of any and all sizes. This will be a good thing and may finally jumpstart the economy and return some manufacturing to the United States. 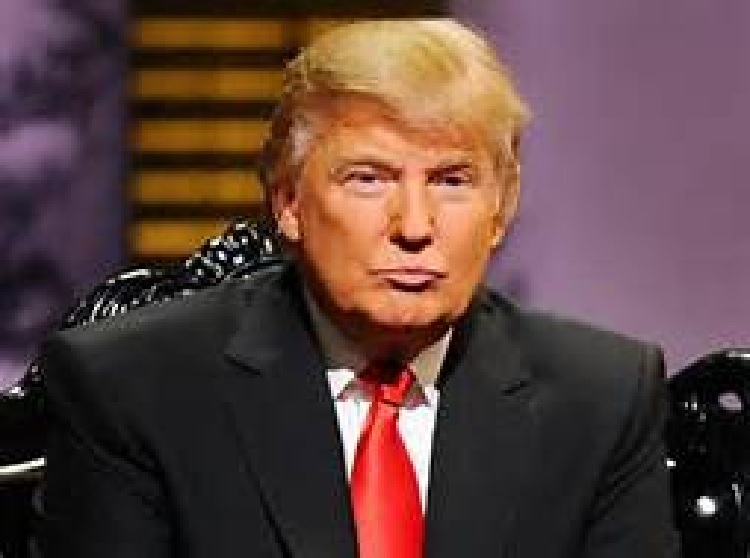 If you must know, there were some things about Trump to like and some reasons to be very concerned, but when push came to shove and many of us stood in the voting booth, we weighed everything and Donald Trump was the safer bet to lead the nation from the doldrums which currently are afflicting America. Trump represented much the same reality and non-membership in the political class. Trump has had employees and even told some, “You’re Fired.” Yes, we knew about his silly show and the fact that much of the time Donald Trump is mainly concerned with selling the brand of The Donald. Yes, we realize he is an uncouth braggart and went through a period where he partook in womanizing, it was called the late sixties and first half of the seventies and all too many of us were almost as bad and that included many women who now claim their vestal status which they had so cavalierly discarded back in the day when fun ruled where there were no rules. Yes, we had our wild days but did not try to burn down cities or destroy entire community areas because we lost an election or two or more, we continued on, grew up and even managed to learn a few lessons along the way. As far as what those lessons were, well, they were lessons acquired the hard way, brutal experiences in which we almost jeopardized our futures. Some of our peers acted as you are currently doing and paid a steep price. What advice can we give you? Make sure you are not among the stragglers and the hanger-on’s who continue protesting until the mass arrests bring it all to an end. When this comes down, all those paid agitators and organizers will magically disappear and those still protesting will pay the full price. Furthermore, what are you protesting about? You lost one election, granted it was possibly your first time voting, but there will be more elections. Eventually, if you ever awaken from the lullaby being sung to you by your professors, who are supposed to be teaching you how to work and operate in the real world at about $30,000 per semester, then you might figure out that there are no safe spaces and you win some and you lose some. Many of your professors never have held a job outside of the ivory towers of academia and thus have no practical knowledge to impart; so they instead fill your heads with propaganda which they were fed by their professors. When signing up for courses you need to do a little research and a lot of soul searching. The first item is you want to take courses taught by some professor who also worked in the real world as they are able to impart at least some useful input. Secondly, choose a major field which will prepare you for employment and making a decent salary once you get on that path, then your life will be one of greater ease and satisfaction. Majoring in Seventeenth Century French Poetry and Love Sonnets may give you greater depth and some valuable quotes and even some pick-up lines, but what kind of job does it prepare one to earn a salary. One need remember that there are probably thirty or forty professors who teach such a major field and none other as most also teach Chaucer and other writings and may also have an archeology degree to augment their great love of Seventeenth Century French Poetry and Love Sonnets. The fields which produce the greatest number of jobs are the STEM degrees, Science, Technology, Engineering and Math major courses. I can hear the moaning and whining complaining that those majors are just so hard and challenging and are not soft and squishy filling one with false sense of worth. You will only get out of life equal to what you invested and then only if you work really smart as well as hard. I know that is what you parents told you and they are idiots and what do they know about the new world, they are so yesterday. Well, back a few years and their yesterday was the future world we were looking at as we stood looking beyond the cusp of our college days and when we all had degrees, it were the students who majored in STEM programs who were getting the lion’s share of higher paying jobs. Even a good share of those who skipped college and went a different route had found their niche and were making good salaries. Technical schools which offer a two year degree are affordable and you learn exactly what you need for a professional career working as an electronic technician, biomedical technician, X-ray technician, and a whole myriad of professional positions which require knowledge in the one area, more than you filling your head with elective courses which teach little of value. There are apprenticeships with large companies who test aptitude and should you have what they need, you can get a highly trained position and some even assist you in buying the equipment you will need to succeed. One such company is Caterpillar, yes, the ones who make all the big yellow behemoths found at construction sites where anything from houses to malls to highways are being constructed. Well, Caterpillar trains people on their equipment and how to operate them safely and productively and then they place you in a position and they even pay a salary while you train, beat that. Driving an earth-mover or bulldozer will make you far more than an ethnic studies degree will likely pay. Granted, many of these professors talk about how people in their field have made very good money; remember these people they speak so highly about are amongst the top five to ten percent of those in their field. Then again, the top five to ten percent of those in virtually any field make excellent money. This includes baseball players, basketball players, golfers and researchers who receive grants to write books about Seventeenth Century French Poetry and Love Sonnets, but there is a very strict limit in numbers of such grants, like maybe one each century and looks like somebody already got this century’s easy train. This means one should consider exactly the earning potential for the line of study you have chosen to pursue. You had best answer this honestly, as it is your entire future riding on this assessment. Oh, and a police record for rioting and destruction of personal property often will make you all but unemployable unless you can also organize and speak publically with moving and motivating words as the leaders of the rioting today are doing. As far as your current acting out because your perceived perfect leader actually managed to lose the election everybody had been claiming for months had it in the bag; not only did your dream woman lose, but she lost to a person you and your peers have deemed to be a cretin. So your perfect candidate who was leading in every poll and who you do not know anyone who was not voting for her managed to lose. How is this possible? Well, have you ever considered that first off, you do not exactly know a whole lot of people and some who are telling you they voted for Hillary Clinton actually voted for Donald Trump. Oh yes there were that select few. If you might widen your pool of people you know to beyond your family, the friends from High School, those two childhood friends you were always seen together with and the people in your dorm and fraternity/sorority, you might develop a different picture of the world seeing it for what it is, diverse. The others who are demonstrating with you have the same tunnel vision of the world and they can only further insulate you from reality, which is obviously in conflict with your perfect little world as otherwise you would not be out in the streets screaming your head off while nobody really cares. That is what even your friends in the media are writing, how these demonstrations will only serve to drive more people away from the leftist defined path. There is one last item, truth. Claiming that Donald Trump is a capitalist pig and then claiming his administration will make America a fascist nation are contradictory. Real fascists love government and honestly believe that the leaders of industry should work under government guidance and the workers’ rights be controlled for the better good. Fascism is actually a left-leaning form of governance where the top management from industry are aligned and working with the government. Industry thus is also guided in order to provide the government their sharing in the profit but somehow the politicians are seldom made to suffer the consequences resulting from their decisions. A capitalist believes industry does best when untethered from government inclusion in the process. The capitalist would oppose any creep of fascist influences hampering any firm from making the highest profit and still manufacture to their own projections and not what government insists be manufactured. Trump is a free market capitalist and if anyone might have favored a fascist form for the government it has been many leftists and especially the high operatives in the Democrat Party and the leftist Republican Party members. Donald Trump is not a member of either group and this will facilitate his working with a select group taken from both parties in the Congress, especially in the Senate where his appointments go for their week of being battered before approval. Should such materialize and Trump include those willing Democrat members in Congress, he will prove to be the President of all the people even including many who are now in the streets rioting. We will need wait and see whether a President Trump is capable of patching together a bipartisan group who will march along with the President and fashion a model and watch it grow. Should Trump increase opportunity, then we will need to admit he was the best person for the job at this time. We will need to see what the future holds.